carbon electrodes have potential difference even with no electrical input? What is happening in this photo? I set up a simple electrolytic cell today of copper (II) sulfate solution with carbon electrodes. It was connected to a powerpack (set at ~8.0V), and a variable resistor with the resistance cranked up to its maximum as in the image below. 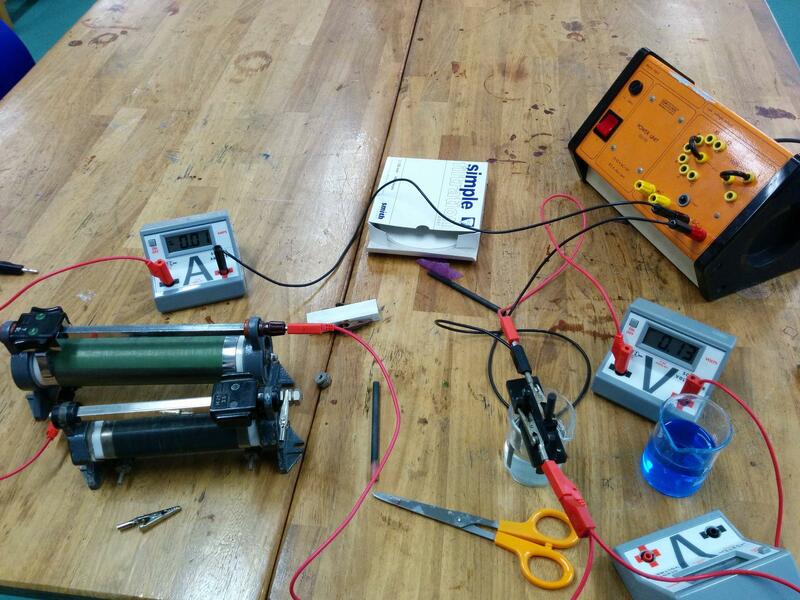 You can also see the ammeter and the voltmeter in the photo. When the powerpack was switched off, the current fell immediately to zero, as expected, but the voltmeter still read a non-zero number (initially 0.80V, then later seemed to decrease to 0.18 V). I turned the electrodes upside-down so that the clean ends were in solution (rather than the end covered in copper), but reading still read the same. Removed the electrodes to a beaker of water (but not deionised water), and it still read 0.18V or close to. Tried the exact same thing with pure copper electrodes, but it read 0.00V immediately upon turning off the power supply. Tried completely taking the leads out of the power supply (which was off anyway), and the carbon rods still read a non-zero value even with the circuit obviously incomplete. What's happening here? Copper electrodes did not show the same effect. Is there something about carbon electrodes in particular that can make them act as a capacitor? The current stayed at 0.00A the whole time. This effect was NOT seen when the electrodes were lifted out of the solution/water. This would be the most interesting answer. I did consider initially this, so first I tried up-ending the electrodes so the clean ends were in solution, but the reading remained the same. Second, it showed no such behaviour with the pure copper electrodes. I think it's unlikely to be a case of the voltmeter left floating. Surely if that had been it, regardless of which electrodes (copper or carbon) were used, random static charges would've been present? Plus, the phenomenon was reproduced when I swapped out different electrodes and then swapped back in the funny-acting ones, so the behaviour wasn't exactly random. However, I did forget to mention, that I also tested this with a second clean set of carbon electrodes and got 0.00V! Support for 2nd explanation (but if so, how does that work exactly?). I still would've liked it to have been the 1st explanation. I also note that I left the apparatus overnight, and by next morning the reading was 0.02V. I've unfortunately have had to clear the materials away now, but if I get a moment I may try replicating the result. Porous carbon electrodes do act as a capacitor, the basis for supercapacitors (aka ultracapacitors). You are electrolytically depositing copper on the negative electrode when you run current through the solution, even though it might not be enough to see. This creates an electrochemical cell. Simply disconnecting the power supply leads will leave a high-impedance voltmeter floating, so it might be detecting random static charges. You might need to bypass the voltmeter with a high resistance (10 or 20 megohms) to reduce static sensitivity. Not the answer you're looking for? Browse other questions tagged electrochemistry electrolysis or ask your own question. What is going on in this reaction? Why does decreasing the distance between the electrodes in an electrolytic cell increase the rate of electroplating? Side products during the electrolysis of Copper Sulfate? What is the greenish substance formed after the electrolysis of two graphite electrodes in a sodium sulphate solution?